Tomato, Capsicum and Beans. Sometimes planted with dill, fennel and other upright herbs, bush snap beans, chard. Tall, single-flowered varieties attract butterflies. Plant zinnias in spring, after the last frost has passed and the soil is warm. Start seeds indoors in individual containers, set out purchased plants, or direct-sow into warm soil. Poke seeds into the soil about one-half inch (1 cm) deep and 3 inches (8 cm) apart. Thin to 12 inches (30 cm) apart in all directions for dwarf varieties. 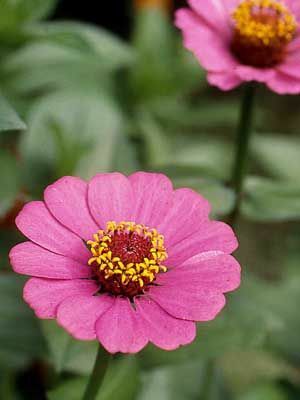 Zinnia varieties that grow more than 24 inches (60) cm) tall require 18 inches (45 cm) between plants.